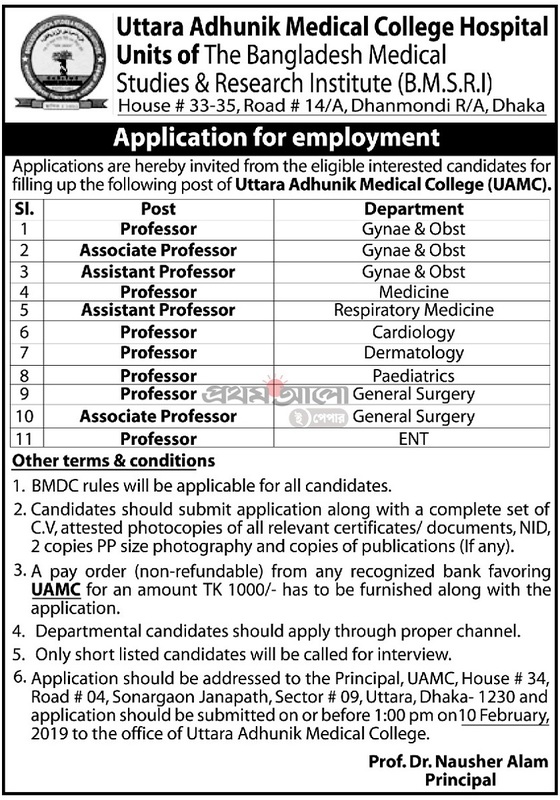 Uttara Adhunik Medical College (UAMC) Job Circular 2019 has been announced new job opportunity notice for the job seekers that’s way to get form all of information with job circular image, published date, application deadline, salary and more from the best online job portal website in BD Jobs Careers. Well, we would like to inform you that, the Uttara Adhunik Medical College (UAMC) is one of the popular medical college in located Uttara. Well, good news is, recently the medical college looking various positions new job holder. You can see all of details by given BD Jobs Careers and if you think you are suitable for this job please submit your application. ■ Post Position Name: See Job Circular Image. This entry was posted in All Jobs, Dhaka Jobs, Graduate Jobs, Hospital Jobs, Jobs Notice, Medical Jobs, Medical/Pharma, Newspaper Jobs, Private Job, Prothom Alo Jobs, Today Job by admin. Bookmark the permalink.